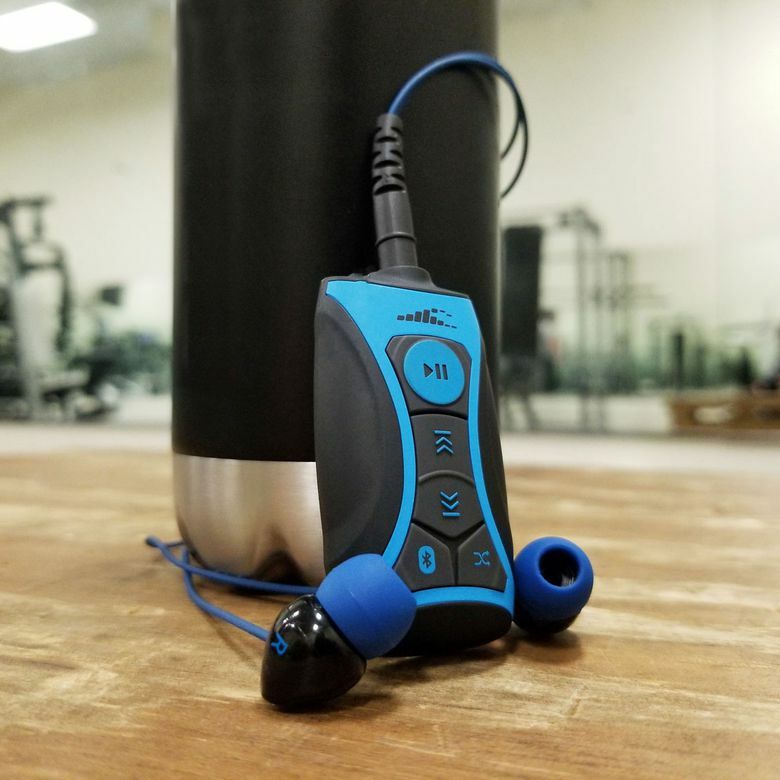 The H20 Audio Stream MP3 player is a neat device that makes its mark by being light, easy to use, and most importantly—waterproof. The H20 Audio Stream waterproof MP3 player stand up to the hype of its features, offering genuine waterproofing and underwater listening. Not only that, it’s a great device for those of us who prefer to stay on dry land and in the comfort of squat racks and benches. The Stream’s powerful bass pumps out some great sound from its 8GB of storage, even if it loses some of that “oomph” while underwater. After a week’s worth of sweaty workouts, showers, and underwater excursions, we came away impressed, though a bit hesitant due to the high price. The H20 Audio Stream is a super lightweight device, weighing in at 3.5 ounces and not much bigger than an Airpods case. The outer shell is a tactical, matte finish that feels similar to the plastic on a phone case while never being unpleasant to the touch. This finish is easy to wipe off, which is good considering the device is meant to be dunked, boasting an IPX8 waterproof rating that allows it to be submerged up to 12 feet. The buttons on the front of the device have a nice, clicky feel to them, letting you know when you’ve pressed a button or not. This is especially useful for when you don’t have time to look at the device. The buttons do, however, get a bit clunky since the forward and backward skip also functions as your volume sliders, requiring they be held down to raise or lower the noise. I appreciate the attempt to streamline the interface, but I would have preferred independent buttons for volume. The versatility of the Stream comes from its 360-degree, serrated clip that allows it to be firmly positioned just about anywhere, including hats, goggles, shirt collars, and more. We even found that it clipped onto our glasses extremely well, all without ever weighing us down or getting in the way. Clipping the Stream to the back of our shirt came in handy during squats and overhead press workouts, as it never got in the way. Some of the most comfortable earbuds we’ve ever used. That 8GB of internal storage is clearly H20’s big selling point for the Stream, as one of the things they mention across all of the device’s literature is how it has more storage than the discontinued iPod Shuffle waterproof model. For those wanting your own tunes transferred, the Stream uses MP3, WMA, FLAC, and APE formats. The extra space is welcome, especially since Bluetooth doesn’t work under the water. The real bummer here is that it comes with a proprietary charging cable, which in this case is an auxiliary plug connected to a USB connector. This is likely due to the need to keep the device waterproof, but it’s yet another cable to keep track of. It’s a shame H20 couldn’t make it a different color than the same black of every other cable. Worth mentioning is the bundle the H20 Stream came in, which included the Surge S+ waterproof earbuds. These tiny plugs are expensive but shockingly comfortable and excellent at keeping water out. It's a pricey bundle in the realm of waterproof devices, but the earbuds are good at what they do. Just as important, they’re comfortable during long workout sessions. Claiming 15 years of development, H20 says the secret to the Stream’s underwater audio success is a patented low-frequency bass that keeps audio from sounding tinny. We can attest that the Stream sounds great while in or around the water, but that quality seems to come at the cost of low volume. We could never get the sound as loud as we wanted, especially when submerged. The loudness got a bit better when we tinkered with our phone’s EQ settings, but volume still always felt just a bit on the low side. Sounds great while in or around the water. The Stream connected via Bluetooth to our phone easily, with only one button needed. The range before connection distortion occurred was around 25 feet indoors, or 30 feet outside. Of course, Bluetooth stops working once the Stream goes underwater, but the wireless capabilities in the gym are still useful. The Stream’s product sheet claims 10 hours of playtime before needing a charge, but we found it took around 11 and a half hours before it needed to be plugged in. Recharging took a little over an hour, meaning you can get a good, short charge in a pinch if you’re in a hurry. Whether you’re getting the approximately $100 bundle that comes with H20’s Surge S+ headphones or just getting the standalone player, this is still a pricey product. The Stream is more than its next direct competitor, the SYRN MP3 player. That said, it’s still cheaper to buy than its old foe, the iPod Shuffle, which was $250 back in the day. Looking closer at the aforementioned competition for the H20 Stream, a lot depends on how much you’re willing to spend and how important the extras are to you. The SYRYN Waterproof MP3 Player from Swimbuds comes with some neat added accessories such as goggles, headphones, a hair guard, and something called FitGoo. This bundle is affordably priced and well-reviewed according to Amazon customers. The other more haunting specter is the now deceased iPod Shuffle 4th Generation model, which has the Apple seal of approval and a price tag to match. You’ll be lucky to find a new Shuffle for under $200. Ultra-comfortable fit, but slightly overpriced. ﻿We can say that through our period of testing, we suffered no issues or failure with the H20 Stream and found it to be a worthy device on both land and water. The Surge S+ headphones are some of the most comfortable earbuds we’ve ever used, and the onboard storage and Bluetooth connectivity are strong enough to keep you detached from your phone during workouts. Product Dimensions 2.3 x 1.2 x 0.8 in.